This calculator allows users to find the true cost of owning a car. It will normally give them a good estimate of what they really need to spend on car ownership. As car payments and expenses come due throughout the year, it's often difficult to really get a good understanding of total spending on a car. This calculator also provides to the user, optionally, the car's full Financial Effort considering the user's income, further providing also optionally the equivalent public transport costs (bus, train, UBER, etc. ), considering the user doesn't own a car. The translations are in corresponding json files, namely in the folder src/countries/. 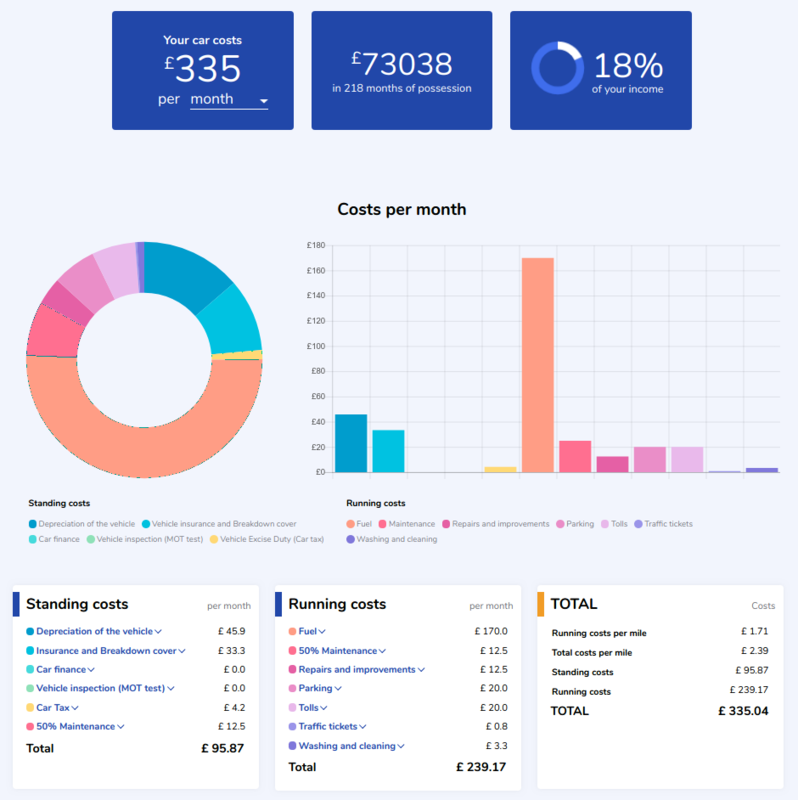 Autocosts uses nodejs, expressjs and handlebars to supply a server application that renders a car costs calculator as a webpage loaded by any common browser. The project is optimized for a web-based version, and for an APP developped in Apache Cordova. The 2 last letters on the URI stands for the 2-letter ISO country code, and not for the language, since for example United Kingdom and Australia have the same language but different realities concerning the taxes, the terms applied to automobile costs and the units for fuel efficiency. The translations/language files apply therefore only to the selected country. The project already considers all the units and fuel efficiency cases, different in many countries. The variations for fuel efficiency are l/100km, km/l, mpg(US), mpg(imp) and for distance are km, miles and mil (Nordic mile=10km). More information can be found in the directory src/countries/. Autocosts supports the following additional services, which can be enabled or disabled (default). After building with node build.js, run node bin/index.js -h for more information. Autocosts also supports code such that the user inputs might be stored into a mysql database. With the data from said database, it is also possible to make several statisitcal analysis, namely the average costs for each country, said statistical analysis having outlier removal techniques, such that such outliers do not distort the average. Autocosts may use the UBER API, such that at the final repport, the user calculations can be compared with the equivalents costs if the user would use just UBER or combined with public transports. Autocosts uses chartjs.org as it is free, open source and can be used offline. Autocosts also allows the final report to be printed into a PDF report. It makes use of pdfmake npm package. This calculator is and shall always be completely anonymous, as it doesn't request nor permanently store, any name, email, cookies, IP address nor any other personal information.